Nearly 1,500 extra people in Cornwall were put on Universal Credit in October. That’s up from 8,487 people just a month earlier, meaning a further 1,482 individuals in Cornwall were moved on to Universal Credit last month. An idea developed in the South Hams to help people with dementia has won a major national award. Printed in hundreds of care homes each day, The Daily Sparkle is a newspaper which looks at a new issue every day. It aims to help those living with dementia by reviving their memories. Now, it has won the Lloyds Bank Business Award for Positive Social Impact. Founder Chris Harding said the service does make a difference. The city council says the government has failed to commit to supporting the maintained nurseries beyond 2020 – creating uncertainty for staff and families, and making planning difficult. The project will be reviewed in the spring term, with the option of extending it for another year. The nurseries also cater for pupils with Special Education Needs and Disability. The Department for Education says local authorities have been given around £60m a year to protect maintained nurseries up to 2020. After that, funding will be determined by the next local government Spending Review. A man has been arrested after allegedly walking into a shop with an air rifle, police have said. The suspect - who was wearing a mask - was detained by security staff until officers arrived. Devon and Cornwall Police were called to the Tesco Metro in Cowick Street, Exeter at 15:30. No injuries have been reported. The suspect is in custody. Eight years after arsonists torched and destroyed a church hall in Newton Poppleford, a new meeting place is set to rise from the ashes. In August 2010, two sheds at School Lane, in the centre of the village were set alight and the blaze quickly spread to St Luke's Church nearby. About 10% of the church was damaged by the fire, but the church hall - which was the meeting place for the 24 members of the first Newton Poppleford Brownies - was destroyed. The group lost everything including craft materials, cookery equipment, sports equipment and the parade flag they used for special occasions like Remembrance Day. No charges or a prosecution into the arson attack was ever brought forward by police. Now, plans have been approved by East Devon District Council planners for a new meeting place to replace the original fire-damaged hall. The new hall will be used for church-led youth groups, social and elderly people work, committee meetings, coffee mornings and fundraising events. A £200,000 appeal has been launched by the church to raise enough to build the new building - which will be called The Meeting Place. It is hoped the hall will be opened by the end of 2019. A man was left with "serious head injuries" after being knocked unconscious by another man in Plymouth, police have said. The assault happened on Monday 5 November at about 21:10 outside the House of Fraser store on New George Street. Devon and Cornwall Police has launched an investigation. Any witnesses are being asked to contact officers via 101. 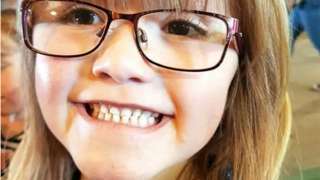 Sarah Burgwin wants the NHS to pay for Orkambi to treat her six-year-old daughter's cystic fibrosis. Cabinet members have gathered in Downing Street for a crucial meeting on Theresa May's draft Brexit agreement. The prime minister spent Wednesday morning holding more one-to-one talks with her senior ministers - trying to win their support. Speaking at Prime Minister's Questions, she insisted the 500-page deal took the government "significantly closer" to delivering the referendum result. But the proposals have been met with a hostile response from Conservative Brexiteers. A planning application has been submitted for improvements to the North Devon Link Road. It was announced at Devon County Council's Cabinet meeting on Wednesday - with the authority proposing to widen four miles (7.5km) of the road between Barnstaple and South Molton. The improvements to this section of the A361 will "provide more overtaking opportunities and will improve the safety and the reliability of journey times on the route", the council said. The application is currently out to consultation and responses must be received by 2 December. The submission of the planning application is very welcome news and this is another important step forward in preparing the scheme. This vital project is progressing on schedule and as planned, and work is continuing on the full business case. The application is part of a wider £93m scheme to improve the North Devon Link Road, which also includes improvements at five other junctions: Buckleigh Road, Heywood Road Roundabout, Westleigh Junction, Bishop's Tawton Roundabout and Borner's Bridge. A care firm has pulled out of an £8m five-year contract to help people at home after they leave hospital in Plymouth. Gemcare South West was given the joint Plymouth City Council and Devon NHS contract in September to take over at the start of December. The new Independence@Home service combines the city’s rapid discharge service with the council’s reablement contract which expires on 2 December. But the council’s cabinet – made up of senior members of the ruling Labour group – heard on Tuesday the care firm now did not want to go ahead. Members agreed in principle for the council to take control of the service with day to day management support from care partner Livewell Southwest. The final decision was delegated to be taken after financial checks have been carried out. Councillors also agreed if the in-house service could not be set up in time for the start of the contract, a short-term extension up to a maximum of March 2019 should be negotiated with current provider HSG. A strategic review will be carried out after 12 months to decide the future of the service. A £3,000 reward is being offered after a man was "repeatedly shot" with an air rifle in the centre of Ilfracombe. He was walking along the High Street at about 02:30 on 30 September when he was shot at from a flat above a shop. He had to have surgery to remove pellets from his chest, stomach and hand. Crimestoppers is offering the reward for information that leads to an arrest. All St Mawes Ferry crossings between St Mawes and Falmouth have been cancelled today due to the sea conditions. In an open letter to the struggling airline, they say the airport brings in £150m a year to the local economy and creates "high value local jobs" which they do not want to lose. Four people were arrested in Brixham after police were called to the town to reports a firearm had been seen. Officers were called at about 23:30 on Sunday 11 November to the Berry Head Road area. Two men, aged 24 and 25, were arrested on suspicion of robbery and later released on bail. A 21-year-old man and 21-year-old woman were also arrested on suspicion of assisting an offender. They were later released under investigation pending further inquires. Anyone who witnessed the incident or has any information is asked to contact police via 101. Exeter lock Sam Skinner is in the Scotland side for their final autumn international against South Africa. The 23-year-old made his debut last week after being called up to the Scotland squad for the first time. The Devon-born forward qualifies for Scotland through his father. A30 Cornwall eastbound severe disruption, between A391 and A38. A30 Cornwall - A30 blocked and queuing traffic eastbound between Innis Downs Junction and Carminow Cross, because of a jackknifed trailer. Caravans have been involved in 52 crashes in Devon and Cornwall in the last three years, a Freedom of Information request to the police has revealed. The figures show that 21 of the 52 crashes took place on "unclassified" roads in the region, while nearly half of the incidents took place between May and August. However, the data only records incidents in which there has either been an offence committed, allegations of an offence have been made, other emergency services were called to the scene of the collision, or it was a single-vehicle collision where it had lost control. 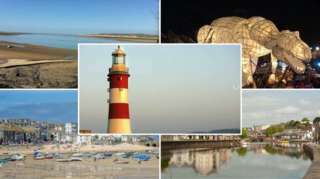 Of the crashes, four took place on the A30, three on the M5, four on the A39, while six happened on the A38. June 2016 was the month that saw the highest number of crashes - five - while there were four in May 2016 and May 2018. Volunteers are sleeping out at the Eden Project this week to raise money for two homelessness charities. One hundred participants are set to endure a cold, wintry night on Thursday - in front of the Biomes - with just a sleeping bag and cardboard mat for the fifth annual Sleep Out. Before bedding down, those taking part will hear a series of stories and talks from people associated with the two charities - St Petroc’s Society and the Amber Foundation. There will be a talk from Raynor Winn, author of the The Salt Path, a best-selling book about becoming homeless and walking the South West coastline. Also on the programme are cookery workshops and entertainment from singers Daisy Clark and Suzie Mac.